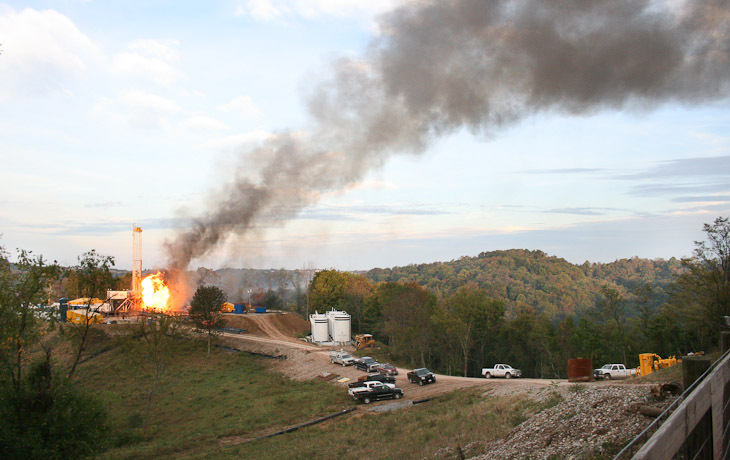 New Injection Well Permit in Athens County? 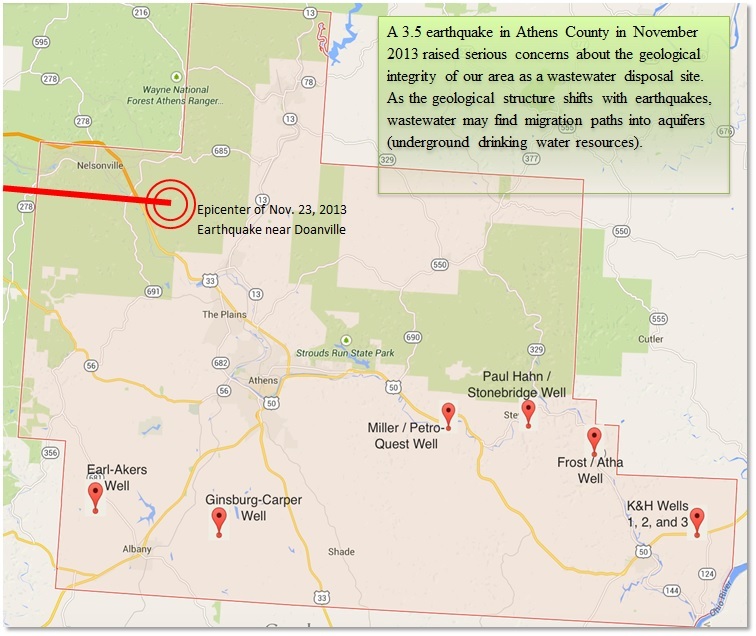 A public notice for an Athens County injection well permit application for the Atha well on Rte. 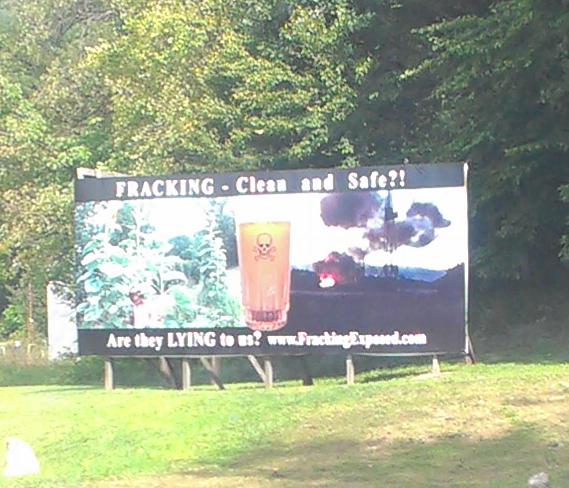 144 near Frost, OH, has been posted. Citizens have until Sept. 28 to send in comments and concerns about the application to the Ohio Department of Natural Resources (oilandgas@dnr.state.oh.us, include reference: Permit # 3761 and application # aAMY0000706). 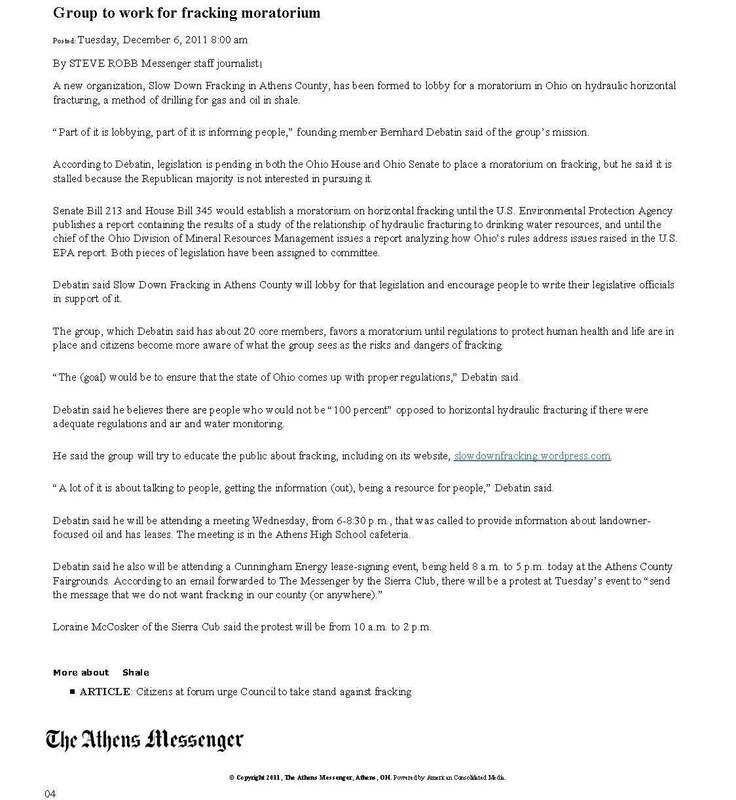 “We call on everyone who cares about southeast Ohio drinking water and public safety to tell ODNR we must have a public hearing on this permit application,” stated Former County Commissioner Roxanne Groff, an organizer of the effort and last week’s public meeting, attended by 50 in Athens. “We have until Sept. 28 to tell ODNR we don’t want this dangerous waste dumped on our land or 50,000 gallons a day of toxic liquids being hauled on Ste. Rte 44 along the Hocking River, 24 hours a day, seven days a week,” she stated. Groff has been growing increasingly alarmed as she studies the rules and practices involved. “The 1200 barrels–over 50,000 gallons–a day will be hauled on twisty narrow roads with school buses and young drivers going to nearby schools. It is reckless and irresponsible to allow this dangerous activity on our rural roads,” Groff stated. She explained that tanker trucks carry 75-100 barrels and semis up to 150-200 barrels, meaning as many as 16 tankers or eight semis daily. The trucks are permitted to dispose of waste 24 hours a day. The waste is intended to reach the porous rock formation at the end of the pipe, about 3000 to 4000 feet down. “I’ve read the Atha permit application. This well does not even have an annulus,” stated Teresa Mills, Buckeye Forest Council fracking coordinator, who has been studying Ohio injection wells for decades. She explained, “The annulus is the envelope of sealed fluid between the pipe and the cement casing. It’s what allows inspectors to see whether the well pipe and casings have been breached. If they check the pressure of the annulus and it’s low—or even non-existent as the Ginsburg well in Lee Township has often been—that means there’s a leak.” She concluded, “The fluid could be going anywhere.” The Atha well is a converted production well. 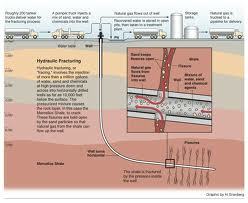 All new injection wells must have an annulus, Mills explained. Mills has recently been poring over records of all 177 Ohio injection wells as well as permit applications and found extensive serious violations that have not been corrected. She spoke in Athens on Friday at Madeline ffitch’s press conference about the Ginsburg well. “For 26 years, this well has been in violation,” she stated, adding, “For ten years, the Ginsburg well went uninspected.” An examination of ODNR records shows repeated references to “no pressure detected in annulus.” The well has continued to accept waste except briefly when the county cut a trench across the driveway to prevent access in 2003. “This new permit application is the just the tip of the iceberg,” added local business owner Christine Hughes. 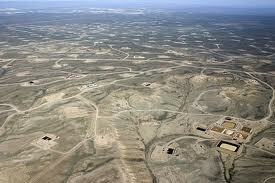 “As more wells are drilled in Ohio, more waste will be headed here. 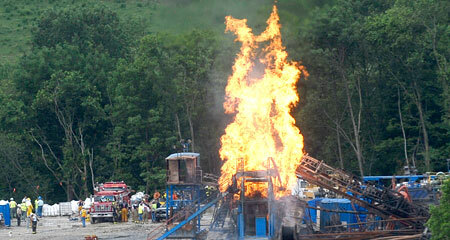 West Virginia, Pennsylvania, and New York don’t allow their fracking waste to be disposed of in their states,” she stated. 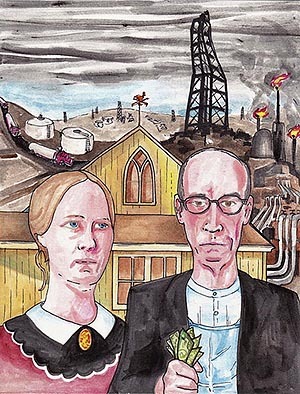 She concluded, “We know we can expect much more of this toxic waste in Ohio, with the intensity of shale drilling heating up and our own governor welcoming other states to use us as a toilet. I think citizens should demand Ohio shut the lid and hold the oil and gas industry to common sense standards of safety and stewardship.” 53% of the 12.2 million barrels of “brine” injected into Ohio disposal wells last year came from out of state. Citizens can write to ODNR Division of Oil and Gas (oilandgas@dnr.state.oh.us rather than incorrect e-mail info disseminated previously) by Sept. 28. Letters should include a reference to the DT Atha Well Permit # 3761 and application # aAMY0000706. Supporting materials, including the Atha application, ODNR Ginsburg records, letter writing information and other pertinent documents, are available at Athens County Fracking Action Network’s injection well page at acfan.org. This entry was posted in Community Disruption, Health, Injection Wells, Water Monitoring and tagged drinking water, water contamination. Bookmark the permalink.